Snakes, Tarantulas,Gorilla's, Engineering, Wildlife Adventures, Elements, Programming, Environments, Electrics, K'NEX and Storytelling. Yes it is that time of year again - the 2018 Caithness International Science Festival is ready to kick for an even bigger festival. This is the 16th Annual Festival and "the biggest and best to date, there is already a buzz of excitement around" according to Chairman Iain Baikie. "We are really excited to have NASA Astronaut Duane "Digger" Carey coming back to Caithness for the festival. Duane is such an inspirational speaker and very giving with his knowledge and experience. 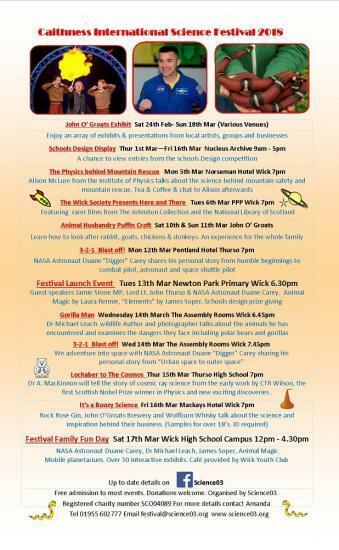 With this in mind we have scheduled Duane in to visit as many schools as we possibly can as well as hosting two public events where everyone is welcome to attend"
" We have invited science presenter groups from Caithness, Edinburgh, Aberdeen and further afield to entertain and educate our primary and secondary pupils", he says. An expansive range of exciting public engagement events have also been organised, which members of the public and families should find interesting and attractive.